Since I first arriving in Mexico I have shed a number of pounds this is due largely to 3 factors: Drinking approximately 3 liters of water a day, an absolute must in this hot humid climate; Walking nearly everywhere; and and thirdly eating mostly fruit and veggies. 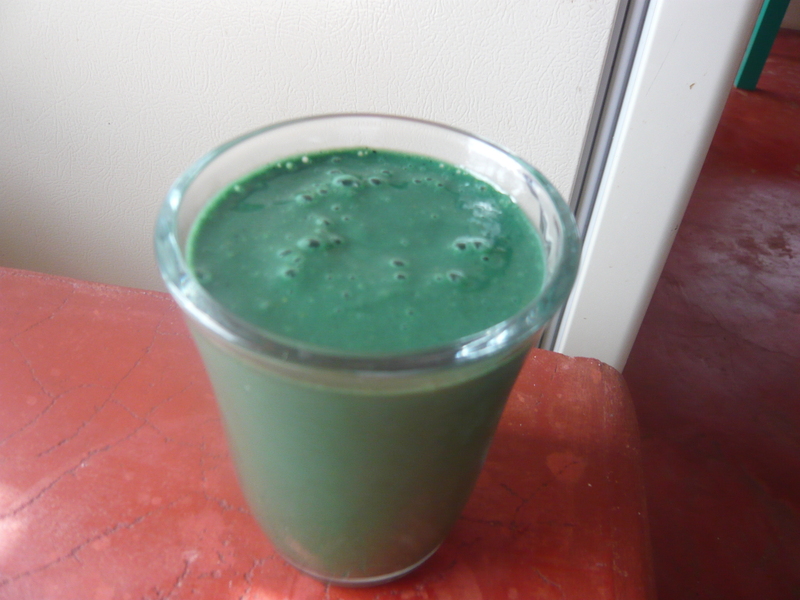 My diet now is totally vegetarian, so I added 2 natural additives that I’ve tried since being here in Mexico..
1) Spirulina a natural “algae” (cyanbacteria) powder that is incredibly high in protein and a good source of antioxidants, B-vitamins and other nutrients). More about Spirulina. 2) Chia seeds, which contain, fiber, protein, calcium, manganese, magnesium, phosphorus, zinc, vitamin B3, potassium, vitamin B1(Thiamine) and Vitamin B2, Used by the ancient Aztecs, Incans and Mayans for its medicinal force and as a major source of energy. More about Chia Seeds. My estimate for most of the meals I prepare cost between 10 Cents and 75 Cents USD each meal. All the fruit and veggies are purchased at the local fruit and veggie stands and markets. 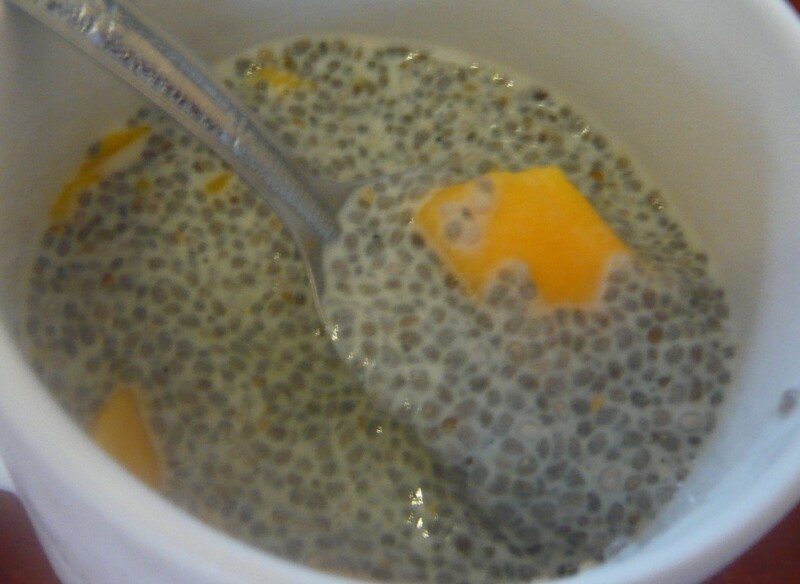 This is my favorite way to eat chia: Fill about 1/2 cup with milk or water; stir about 1 teaspoon chia seeds into the liquid, the seeds expand fairly fast so the longer you leave them the thicker the pudding, stir them well. Add fruit and mix well. You can eat this immediately, of for a thicker pudding put in the fridge for an hour or leave overnight. The pudding is very filling and taste great, I like to eat it for breakfast. 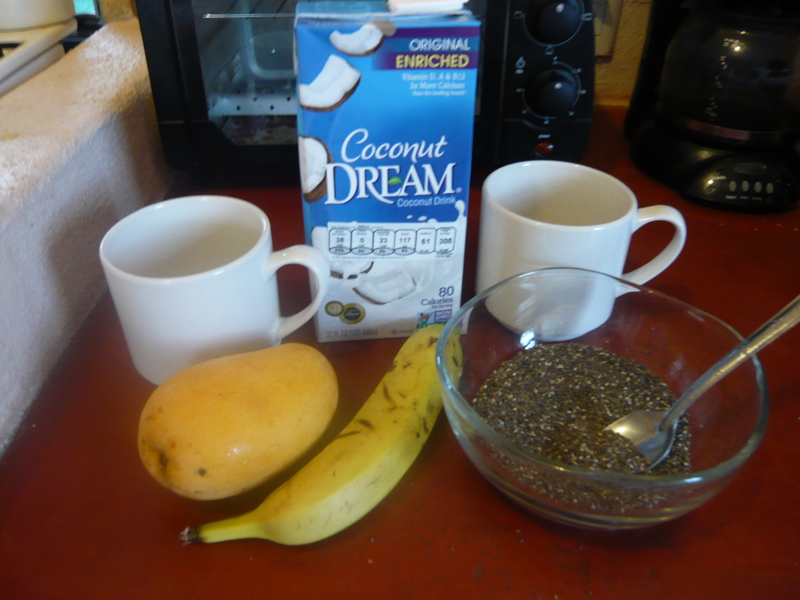 Chia seeds can be added to smoothies as well as many different recipes. I personally prefer the taste of Spirulina with fruit rather veggies. 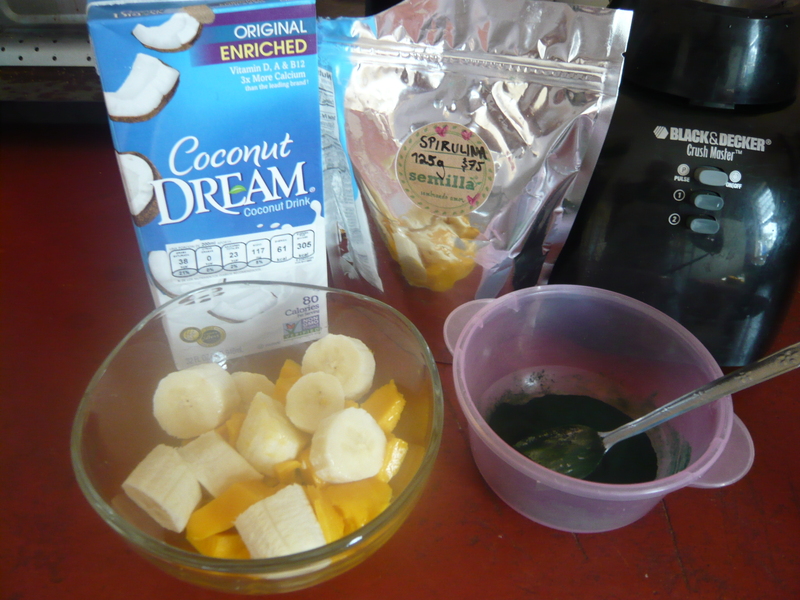 I blend one mango, one banana plus milk, a few cubes of Ice and about 1/2 teaspoon of Spirulina. It tastes good, however it took a while to get used to the bright green color. 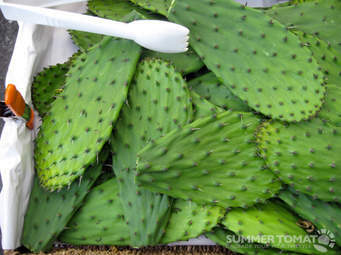 Cactus pads (Nopales) are loaded with fiber, protein and a number of vitamins. When I’ve purchased these I’ve requested they remove the thorny parts, which they skillfully do with a sharp knife. I chop them into small squares and cook in a little extra virgin olive oil, garlic, onions and tomatoes, season with sea salt and a little cayenne pepper. I simmer them for awhile as they tend to be a little slimey similar to okra. 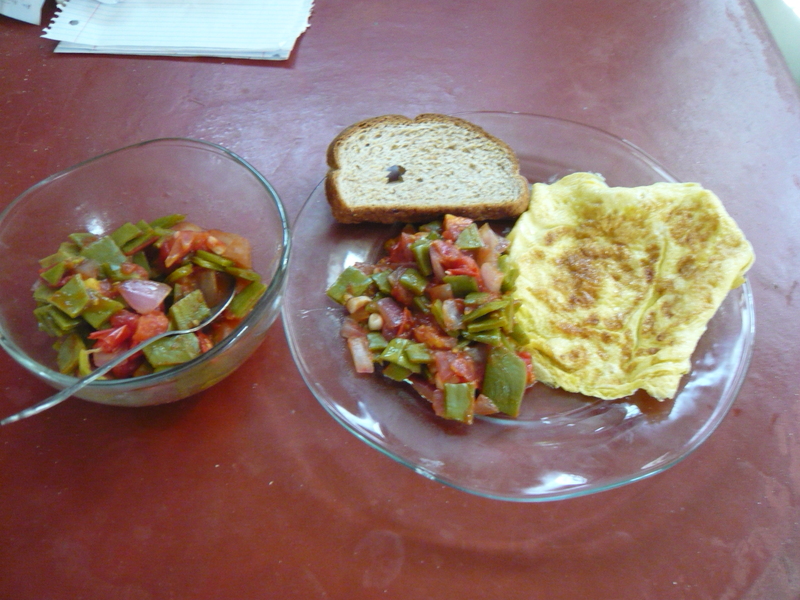 Add a nice omelette (unpasturized eggs), delicious and nutritious for breakfast, lunch or dinner. NOTE: I have not had a single gastric problem since arriving here in Mexico. However, I never drink tap water; I wash all my produce including the ones I’m going to peel, and wipe dry before using. I cook all leafy veggies before eating, like spinach etc. The only time I use ice in a drink is at home as I know it is from the bottled water. Have you been to the museums? other sites? I don’t know if I could go meatless…I’m a carnivore. Losing weight sounds good tho. Glad you are having a good time. Hi Jackie, I haven;t been to any of the museums here as yet, mainly just getting to know the Santiago area where I live. Going meatless has been a gradual process over a number of years, totally lost my taste for it now. If you want to come visit when the weather cools down, you have an open invitation. Take care. Where do you buy spirolina here? I purchased it in Puerto Escondido, I’m sure there is some here in Merida. Next time we meet I’ll bring you some to try.